Fish baked with potatoes is a classic. 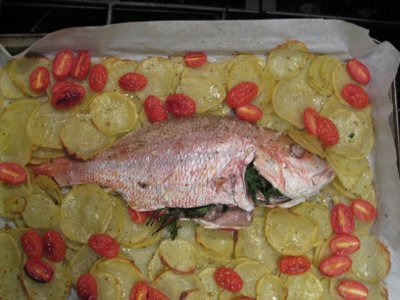 The potatoes baked with the fish are deliciously tasty, and the the grape tomatoes add a nice touch of sweetness. This is how I made this red snapper. First we prepare the potatoes. Clean and peal the potatoes. Cut them in very thin slices, about 2 mm, using a mandoline. Immerse the sliced potatoes in a bowl of cold water, then drain them and pat dry. Chop finely the rosemary leaves together with the garlic. To dress the potatoes, put them in a bowl and add the copped rosemary/garlic, some salt and pepper, and some olive oil. Mix very well. Cover a baking sheet with parchment paper. Put the lemon slices in the center and lay the red snapper on them. Insert some parsley in the fish and dress with salt and a bit of olive oil. Lay the potatoes slices all around the fish and add on top the grape tomatoes cut in halves. Insert in the hot oven and bake for 30 min, or until the fish is ready. If the potatoes are not ready yet take out only the fish and bake the potatoes until ready. I baked them for other 10 min. Clean the fish and and serve it with the baked potatoes.